Ashwell is a picturesque little village in Hertfordshire about 6.5 miles from Royston and this shows the springs (or well) from which the village gets its name. Although the water looks muddy it is actually crystal clear and the colour is from the gravel laying on the bottom in the ankle deep water. 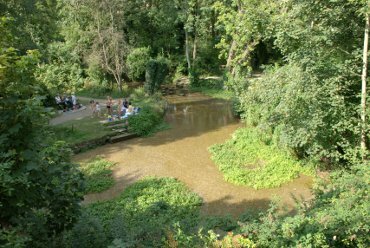 The water rises from several holes in the natural chalk surrounding Ashwell and the average flow is between 1,300,000 gallons a day to less than a million. The flow is at its highest level in March and April and lowest in September and October. In this area we saw a number of places where water could be seen to welling up from beneath and these springs are one of the main sources of the River Cam which flows through Cambridge not far from here. 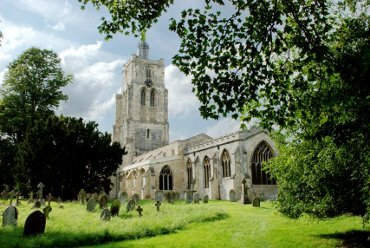 The medieval church of St Mary, built in the 14th century, has a positively massive tower. Not only is the tower very tall but its sides are also extraordinarily broad making it a very impressive church for a small village. Inside the tower at its base we saw some medieval graffiti which recounts the Black Death, a great storm in the late 14th century and a drawing of St. Paul's Cathedral in London before the great fire. Some individual letters are not easy to decipher, being scored into the stone, and it's all in Latin anyway. Forresters Cottages was built originally in the 14th century as just the central hall. Then two cross-wings (the jettied gables) were added in the 15th century. The left wing housed the pantry and buttery on the ground floor and sleeping accommodation on the first floor. The right wing was a solar, having the best rooms for the head of the house. 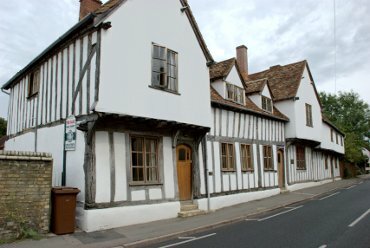 To the right of it (at the far end of the photograph) is a 16th century extension. 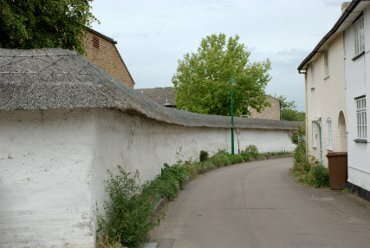 An unusual feature in Ashwell is this cob wall with a thatched top. Cob being an old Devon term for mud and, traditionally, straw and sometimes dung were added to the mud to reduce cracking problems whilst it was drying. Cob walls are extremely durable so long as they are not allowed to accumulate moisture - hence the thatch. The only other thatched cob wall we've seen was in Avebury in Wiltshire.